Last week I implied that I would be writing only about birds of the Rio Grande Valley. Well, we went on a boat tour of the marshes of the Aransas National Wildlife Preserve and saw one of North America’s rarest and most spectacular birds – the Whooping Crane. Promise broken! In the first half of the last century, the Whooping Crane population reached an all time low of seventeen birds – by some counts. There was serious discussion as to whether to save the cranes or let them die out. Some even proposed that the Whoopers should be killed off so that the few remaining birds could be mounted as stuffed specimens perpetuating the memory of an extinct species! This is what unintentionally happened to the Carolina Parakeet, Great Auk, Ivory Billed Woodpecker and Passenger Pigeon among others (the Ivory Billed Woodpecker is reportedly not extinct as previously thought, although there is some debate about the sightings). Fortunately, it was decided to save the cranes. At present, there are about 500 Whoopers overall with about 300 of those in the wild. The remaining 200 are maintained in captivity and used as breeding stock to ensure the survival of the cranes in case of a disaster to the wild flock. At present, there are two separate wild flocks. By far the largest flock nests in northern Alberta in Wood Buffalo National Park and winters in the Aransas Preserve along the coast of southern Texas. A smaller flock has been established in Wisconsin and winters in Florida. This smaller flock appears to be successful as young have been reared in the wild. Other flocks are planned, but the process is very slow. It is essential to have several migratory flocks so that if a disaster (like a hurricane) strikes, at least some of the flocks will be safe and perpetuate the species. Unlike its smaller close cousin, the Sandhill Crane, the Whooper does not flock for migration or for any other reason. It is always territorial even on its wintering grounds, whereas, the Sandhill migrates and winters in vast flocks in the southern USA. This means that the Whoopers need vast amounts of favourable habitat for nesting and wintering. In short, habitat for its survival is not easy to procure and establish. Unless it changes its habits (like the raven or Canada Goose) it will probably never be common. 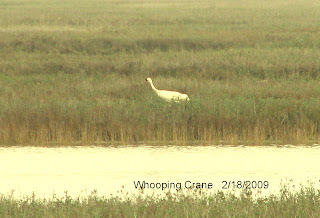 Physically, the Whooping Crane is North America’s largest bird (the heaviest is the Trumpeter Swan). It is pure white with black legs, wing tips and a kind of mask around the bill, and a bald red patch on its forehead (similar to a chicken or turkey). In flight it extends its legs backward and its neck forward. It looks like a white cross with black on all of its extremities. Once seen it is unmistakable. Males and females are identical. 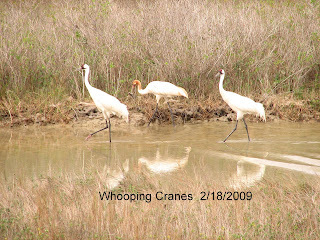 However, some other birds are often misidentified as Whooping Cranes. The three are: the White Pelican (neck and legs are not stretched out, but tucked in so the bird looks pudgy); the Trumpeter and Tundra Swans (wings are pure white – no black tips). .
Whoopers fiercely protect themselves and their young, and are fully capable of fending off a fox or coyote. In fact, the banding of Whoopers was discontinued because of the damage wreaked by the cranes on the banders. This week’s picture shows a family unit of two parents and one youngster. The young one has a lot of rusty brown on it, especially on its head and neck. (I know, your picture is not coloured). The youngster is the one in the middle trying to eat a fish it has caught, but knows not how to eat it! Until next time, adios.